Your reassuring touch can signal comfort, security and love to your baby, allowing them to calm and sleep peacefully. Based on the medically proven benefits of touch, the Zen Sack includes a lightly weighted area on the chest which gives the sensation of a caregiver's palm. Moms who have used the Zen Sack say their babies get up to two additional hours of nighttime sleep within one to three nights. Two zippers open and close almost the entire perimeter of the Zen Sack, making mid-sleep diaper changes a breeze. This design also makes putting on and taking off the Zen Sack super easy, even with only one arm available. Comes in 3-6 months (7-18 lbs, 19-26 inches) and 6-12 months (16-24 lbs, 26-30 inches). Adjustable shoulder snaps allow for a snug fit. Made from 100% luxuriously soft cotton for your baby's tender skin, it is washer and dryer safe. 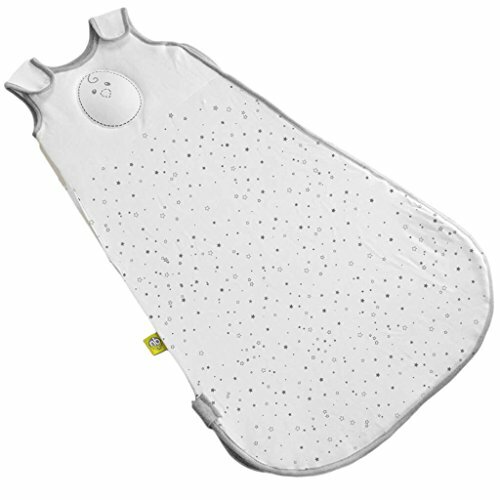 The weighted pad is filled with non-toxic poly beads, the same as you find in children's stuffed toys. The Zen Sack exceeds safety standards. It has passed all mandatory and several voluntary tests. All materials are BPA, toxic and Phthalate free. We know that bringing your new baby home is wonderful... and a little anxiety inducing! There's so much to discover about caring for your new little one. It's natural to feel moments of uncertainty as you learn your baby's cry cues, eating habits and sleep patterns. At Nested Bean, we've experienced the joys and the challenges, the milestones and the tears that come with raising small children. It is this first-hand experience that led us to the creation of the Zen Sack. Your story is our story. If you have any questions about this product by Nested Bean, contact us by completing and submitting the form below. If you are looking for a specif part number, please include it with your message.